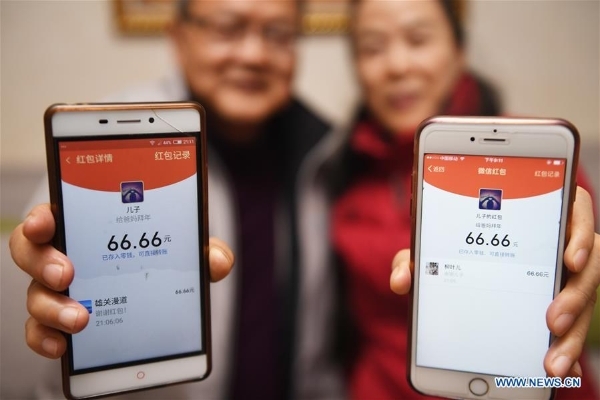 China's inter-bank payment and settlement system passed a tough test on Lunar New Year's eve as the Chinese zealously snatched lucky money in virtual red envelopes for good fortune. China UnionPay, a leading payment network, processed inter-bank payment and settlement deals worth 261.7 billion yuan (about US$39 billion) Monday night, the Lunar New Year's eve, up 81.3 percent from the same day of last year, Shanghai Securities News reported Tuesday on its APP. Chinese artificial intelligence giant Baidu, for instance, took the lead this year by preparing a record high of 1.9 billion yuan (US&281.7 million) for digital red envelopes after becoming the exclusive red envelope partner of the China Central Television (CCTV) Spring Festival Gala, the most-watched annual show on Chinese New Year eve.